Tony Contrabasso (left) and Wayne Wright (right) share information about the Speakers Bureau for New Adventures in Learning. New Adventures in Learning provides programs to local organizations and clubs about lifelong learning opportunities in the Southeast Valley. 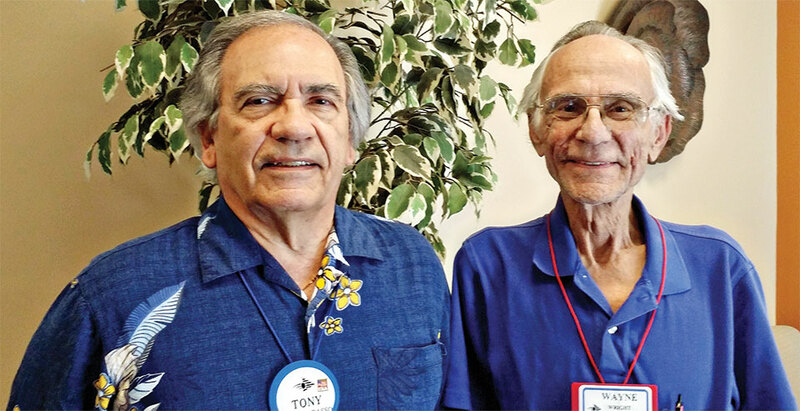 The Speakers Bureau, led by Tony Contrabasso with the participation of Joan Frank and Sharon Felts, can bring a presentation to any interested group. The talk, along with handouts, will share information about current and upcoming classes, membership and opportunities to volunteer within New Adventures. The classes themselves occur, for the most part, at the Sun Lakes Center at the corner of Alma School and Riggs Roads, 25105 S. Alma School Road, Sun Lakes, AZ 85248. Wayne Wright, president of New Adventures’ Governing Council, says, “Tony’s Speakers Bureau would be glad to present an enthusiastic program to your group and answer all your questions about Lifelong Learning and its advantages.” Contact Wayne Wright at wmwright1811@gmail.com to set up a presentation. New Adventures presents more than 40 classes for the summer semester which runs through July 28. To determine which are still available, check with the front desk at the Center. Find a complete class list at www.newadventures.info. Summer hours go from 8:00 a.m. until 5:00 p.m., Monday through Thursday. The Center is closed on Fridays until August 10. An all-volunteer organization, New Adventures in Learning is affiliated with Chandler-Gilbert Community College. Dues are $50 a year. Become a member during the summer semester and receive an extra semester in your annual membership. Dues pay to September, 2018. Add an additional $15 college registration fee each semester you enroll in one class or more. For additional information, call the Center at 480-857-5500.